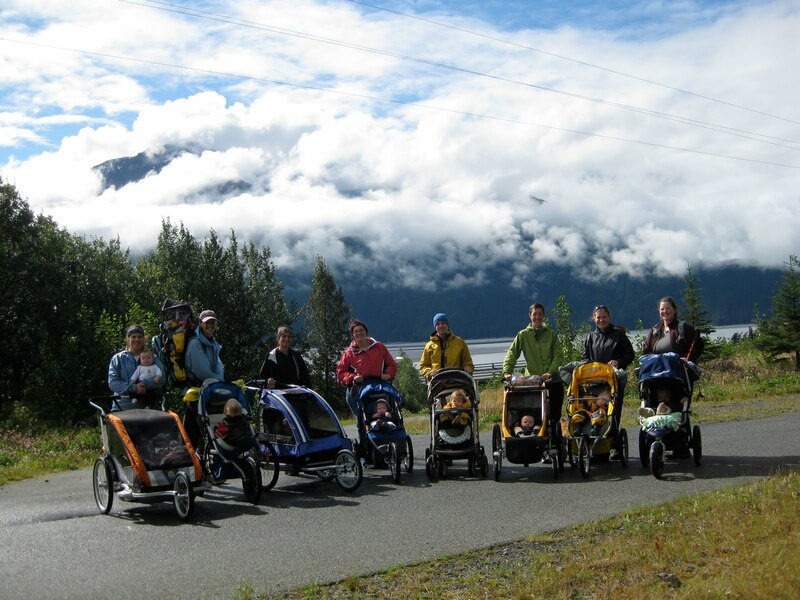 This is a great group of active Anchorage parents. 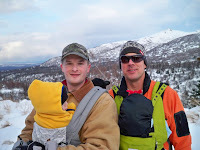 We meet up most Thursdays to hike the great Alaskan wilderness with our little ones. Started by Harmony Apr 30, 2011. 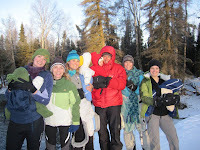 You need to be a member of Taiga Trekkers - Hiking with Kids to add comments! I hope you guys will join us for a facebook chat on Monday. Part military instilation, part downhill ski area, part hiking trails, Arctic Valley is an interesting place with stunning views. 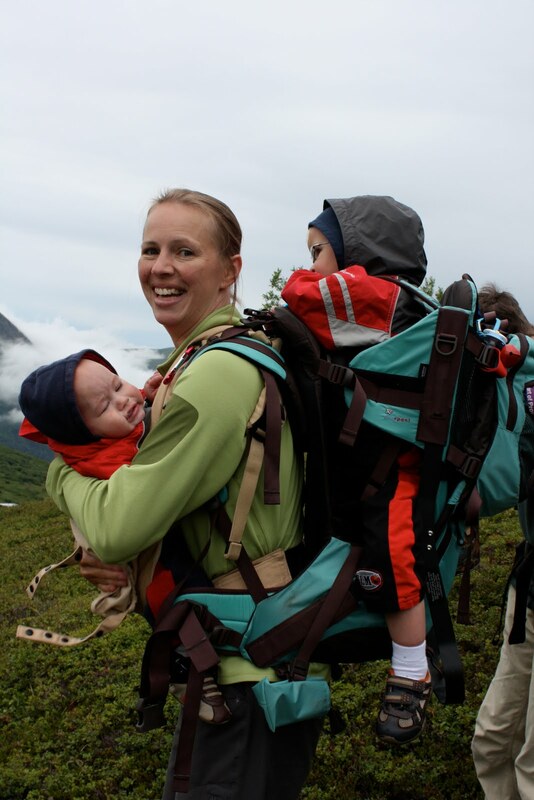 We set off on the Rendezvous Peak trail with 10 mamas, 13 kids and 1 aunt. About half of the pack was new to our group. The group was just the right size to be able to break into smaller subgroups where everyone could get what they needed out of the hike. 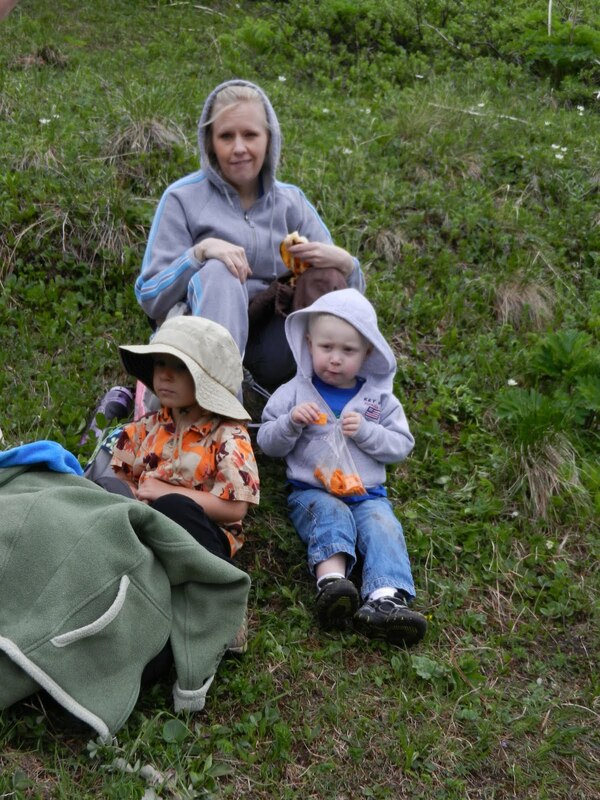 Some mamas wore their kids and made it further up then the other's who kids did their own hiking (but had better naps). The beauty of hiking with kids is they take the pressure off. If you don't make it to the top, it's ok! You have a really good reason. The journey is the destination and everyone wins by getting out, soaking up the beautiful scenery and breathing in the great fresh air. One thoughtful mama brought along an Alaskan wildflower field guide, which was helpful in identifying some of the glorious flowers out there. Among the lupine, wild geranium, dog wood, bluebells, arctic poppy' and fireweed were two new ones to me... kings crown and broad-pettalled gentian. Like many hiking areas in the Anchorage vicinity, you don't start at the base of the mountain. Instead you drive up a good portion of it. Many of the moms reported seeing a baby black bear on the side of the road on the way up. Starting higher up on the mountain is often a good thing when hiking with small kids. It allows you to share stellar views and experience walking on peaks with a little less work. We hiked about 2.5 miles, half of that being upwards on a steady incline. I know I was huffing and puffing a little bit till my breathing regulated. We left just as it was starting to rain. What a stunning, warm, sunny morning! There wasn't a huge turn out for today's hike, but it was perfect conditions for toddler trekking and we met a wonderful new family. Along the trail beautiful wildflowers such as columbine, lupine and roses brought a splash of color to the landscape. The boys found a creek to "fish" in. Later in the summer the trail side is dripping with wild raspberries. Covering a little over 3 miles of ground we ended with lunch at Bird Point. The kiddos took off their shoes and ran around while the mamas basked in the glorious sun! I knew it would be a glorious morning for a trek today when I saw my pups sprawled out basking in the rays of sunlight streaming through the big windows of our little house. The trail would not disappoint! While pulling up to the trailhead of the Coastal Trail from Point Worozof Denali & Foraker were looming over Cook Inlet. Someone is summiting Denali this morning! While our trek isn’t nearly as strenuous as climbing “The Big One” it seems like getting kids out for a morning trek sometimes takes as much preparation. We hiked for a little more than an hour. There were about 35 trekkers out, including moms, dads, babes, toddlers, an aunt, preschoolers and a grandma. We broke into smaller packs along the trail with some parents with little ones in strollers & packs moving at a quicker speed and others with toddlers traveling under their own power bringing up the rear. Some of the preschoolers were riding their own bikes. Point Worozof is at the very west end of Northern Lights Blvd., located right at the end of the runway for Ted Stevens International Airport. Its beach likes on the Tony Knowles Coastal Trail, between Kincaid Park and Earthquake park. We headed through the woods toward the south and Kincaid Park. There are many benches and look outs over Cook Inlet along the way. There were many moose sightings, the chirping of birds loud and sandhill cranes squawking as they flew overhead. What a gorgeous day. So many wonderful new faces. Spring is here! The sandhill cranes were flying overhead on their way further north. Bald eagles were soaring. There were about 42 parents and kiddos combined. Most of the group covered exactly 4 miles. It was amazing to see such a variety of kids at different ages! There were a couple of sub groups with in the groups. All going at their respective speeds as some were carrying their kids, some pushing them in strollers and a substantial bunch with little independent trekkers. We even had a few moms join us from off the trail. We hung out for at least an hour after with the kids playing and snacking. 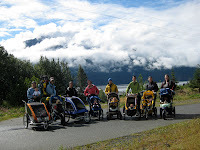 Turnagain Arm Trail from Potter Marsh - Parking lot is just past the end of Potter Marsh heading south. Across the street from the historic plow train. BRING ICE GRIPPERS - some of the trail is clear but the trail in the shade is still packed icy snow in the mornings. Remember to pack a snack, water and dress appropriately for the weather conditions. This is a great group of active parents. We meet up most Thursdays at 10. 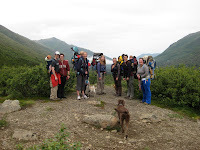 We have also recently added a once a month family Trek to include working families and spouses. The group started out with hiking with just infants and toddler and we have evolved to bigger kids who want to trek on their own. We certainly aren't sprinting up the trails, we take our time and wait for each other to tend to our children's needs. Infants and toddlers are worn or pushed in strollers/sleds. The older kids hike at their own speed. We may not all travel the same average speed, but make sure that no one is ever alone, that there are always two adults together. This way we do not need to worry about keeping the entire pack together. With the cold temperatures in the winter and larger animals in the spring and summer, the buddy system is important for safety. It is also important to break and let the munchkins get out and enjoy nature themselves. 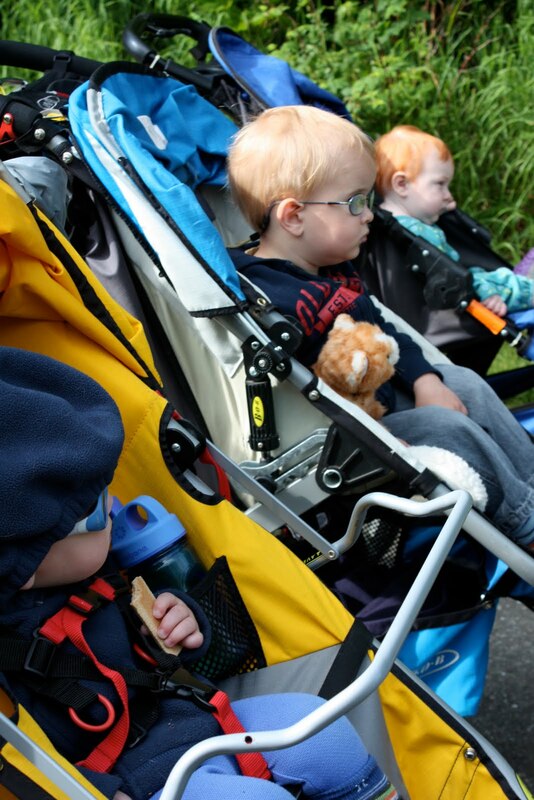 I try to schedule a stroller/sled/pulk friendly event every other week. Setting off on trails we expect to find wonder and are not stressed if we don't get to the final destination. Safety and sanity always come first. We respectfully request that dogs do not come on our hikes. NO DOGS PLEASE - I would love to say yes to dogs, I have 2 myself, but am afraid of what would happen if we all brought our K9 kids. 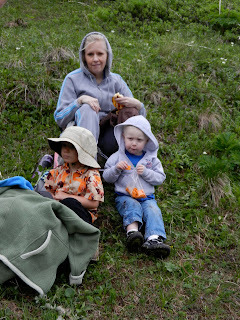 I want the focus to remain on hiking with our little ones. I usually come with Ergo, frame pack and BOB stroller. If you would like to test drive one of these before you go out and invest in one, just email me ahead of time and I'll make sure it is ready to go. We are in the Alaskan wilderness and hiking ultimately is at your own risk. We trust that each adult will act according to what is in the best interest of their child and themselves. It has been a crazy couple of months and I completely lost track of time. I had it stuck in my head that our first hike last year was in April. Looking back through my records it looks like the first hike was March 25th, 2010. The first trek was just another mama, me and our 2 kids, then no one showed up for the second, then 3 for the third and it kept growing from there! We now have about 60 parents who have hiked with us and their kids, not all at one time, but over the course of the year and more joining. It humbles me to see so many active parents getting outside with their little ones. I feel I have benefited so much from organizing this group! The conversations we have had on the trail have kept me centered, validated my choices as a parent, shown me I'm not alone, and provided me great inspiration for things I can do with my family. In Alaska, so many of us are thousands of miles away from the places we grew up, raising our children with out the help of family close by and our friends truly become our surrogate families! Thank you for being a part of the Trekker family! We'll have to have a little party after one of the hikes in April to mark the occasion! It's truly amazing to see how much our children have grown, and how much they love being outside! When we started this group, some of the kids were very new walkers, wobbly on their feet... now they're hiking parts of the trail themselves! Here's a look back at some of the Treks over the past year! While the official start to spring is is past and the eaves are dripping... I don't really feel like it is here until most of the snow is gone and the ground is soggy, saturated and muddy with the run off from the melting accumulation of winter's precipitation. Two pieces of gear that make spring much more fun and enjoyable in Alaska are breakup boots (known Outside as rain boots or Wellies) and a full body rain suit. Now is a good time to start looking for them in your local kid consignment shops, craigslist or ebay, if you're like me and don't want to pay full price. There are two favorite rain suits around here. Both are once piece suits, we like this because there's no place water can get in. They are great for layering, and if you get them a little bigger then you can fit a fleece bunting and long underwear underneath on those chilly rainy days. 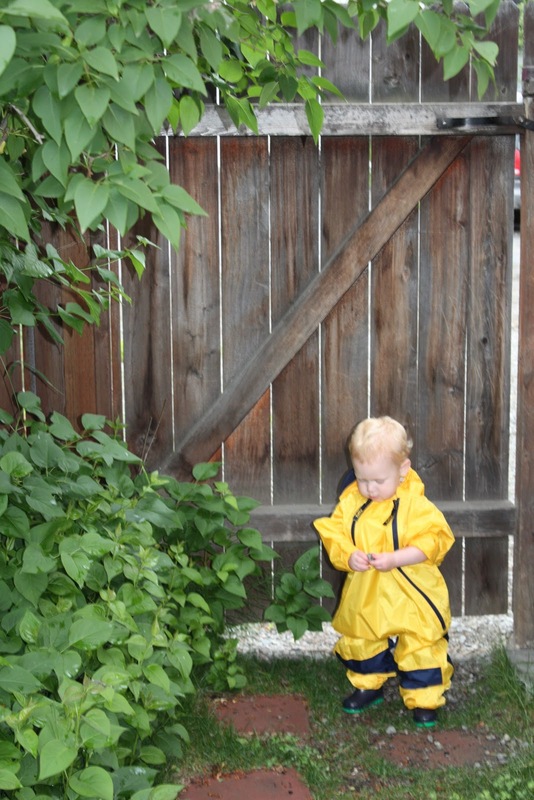 Rain suits meet the needs of both the crawling baby and the curious active preschooler. Wool, poly pro or any other moisture wicking, quick drying base layer should be worn against the skin to prevent hypothermia and general discomfort. Cotton is a No No! The first is the Tuffo Muddy Buddy Suit (click on the link for the manufactures specs). They can be found locally at Junior Towne. They do run large so that kiddos have a full range of motion. 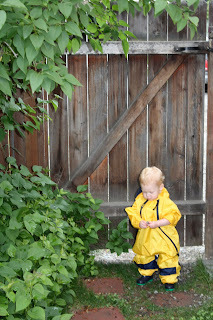 The second is the Oaki rain and boating suit (click on the link for the manufactures specs). They are not found locally but are very reasonably priced (on sale right now). You can also use the discount code "wadingaround" for an additional 10% off! There are many different generic and name brands for rain boots. This is one item you are likely to find at a consignment shop, though finding smaller sized boots for the new walker is tricky. I happened to stumble upon a pair of real Wellies, made in England, for $1.50 at a consignment shop. Regular retail stores around do not seem to carry anything smaller then a size appropriate for at least a 2 or 3 year old. Xtra Tuff makes kid boots so your child can sport the "Alaskan sneaker." The key to finding a good break up boot is finding a light one. Many we've come across are heavy and clunky. You also want to check to make sure there are either very few seems or reinforce ones. Wool socks should always be worn with this type of footwear. They dry quickly and wick the moisture away from the feet. Again cotton is not appropriate. Staying dry, warm and comfortable extends your time outside and keeps the morale up for outdoor adventures weather you're on a family backpacking trip, splashing in backyard puddles, Skedaddling or trekking with the Taiga Trekkers. Mark your calendars for 10:30 am, May 14th. 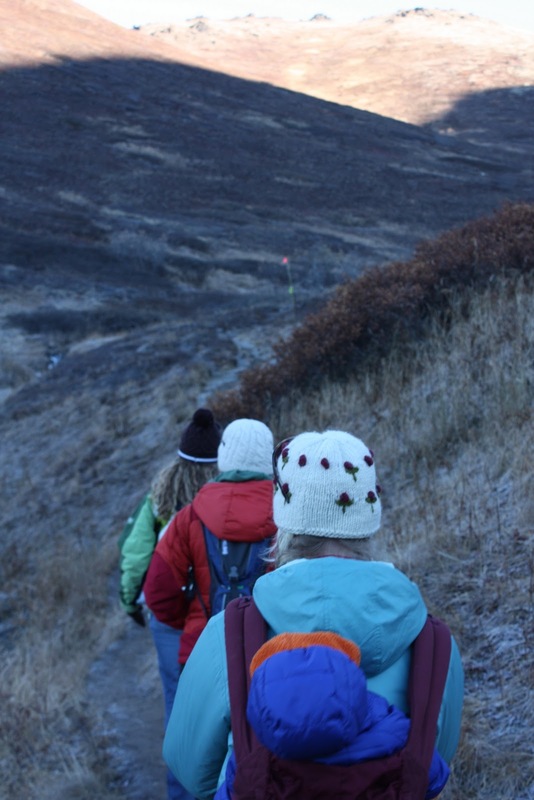 That's when Taiga Trekkers along with the Anchorage Outdoor Family Network will participate in the annual event hosted by the Anchorage Waterways Council as part of the Let's Go - PLAY, SERVE, CELEBRATE initiative sponsored by the Children & Nature Network. I emailed the council who will be getting back to me where we can best be used, and we'll try to find a park near by to picnic/BBQ at after. "It’s a day where nearly 1,000 volunteers throughout Anchorage put on boots and gloves to clean the trash from local streams and waterways. This effort improves habitat for fish and other critters and helps humans thrive too! Each year, volunteers remove several tons of trash. The Anchorage Waterways Council needs folks, families and teams to pitch in and make a difference. Sign up for volunteering here. Creek CleanupThe effort was organized in 1984 when Mayor Tony Knowles called for a group of citizens to organize around improving the health of creeks. The event spawned the Anchorage Waterways Council—which still tirelessly protects, restores and enhances the creeks of Anchorage. Anchorage Waterways Council organizes this event each year through generous financial and inkind donations from the Municipality, the business community, and individuals. "